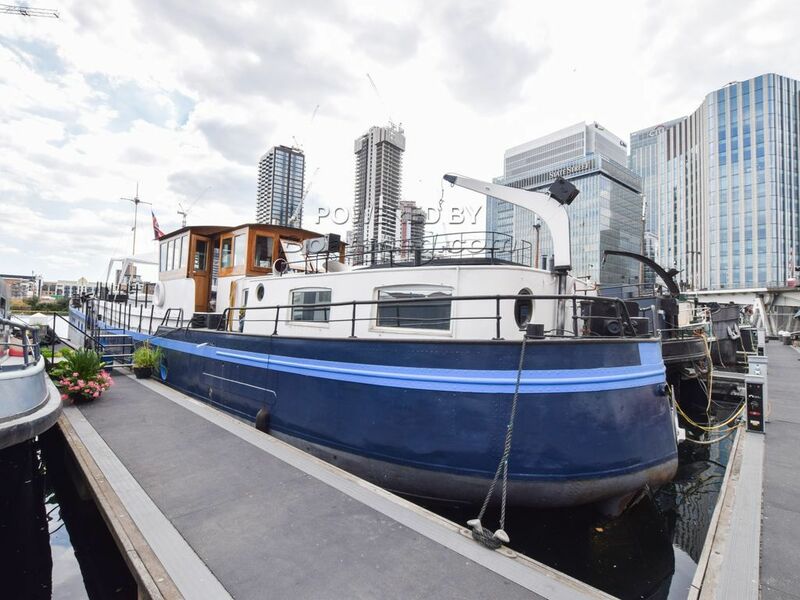 Boatshed London are delighted to offer this fabulous Belgian Spitz barge for sale with London residential mooring. With over 1,400 sq ft of living space, this barge is truly a magnificent floating home. Filled with light everywhere you go, it has been beautifully designed and maintained and with a residential mooring just next to Canary Wharf, this is a great opportunity to purchase one of London's best houseboats. The barge was built in 1958 and was last lifted in 2013 where the hull was surveyed and epoxied. The engine has also recently been serviced in July 2018. Entering the barge through the wheelhouse you are led down the stairs into a enormous open plan living area and kitchen which cleverly conceals masses of storage on either side and is a fantastic place to entertain. The current owners have had dinner parties for 35 guests in the past. At the bow is a bathroom, a sauna, an office space and, up high, a cosy double bed accessed by a ladder. There is also another guest cabin to starboard near the galley and the master bedroom at the stern has a beautiful en suite with shower and bath. There is also plenty of outdoor space on deck and the barge is south facing so you get sun all day out there and in the wheelhouse. Please get in touch for details on the residential mooring and viewing is highly recommended. This Belgian Spitz Barge 28m On London Mooring has been personally photographed and viewed by Angus Rose of Boatshed London. Click here for contact details.